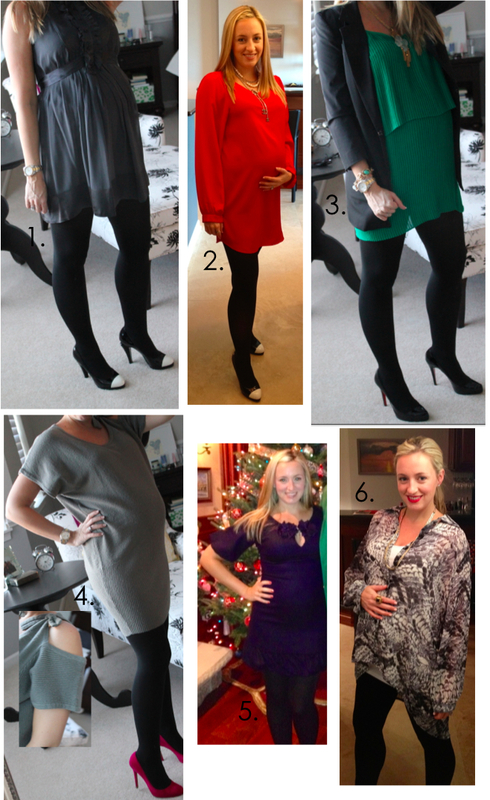 I have been getting a lot of questions about what I have been wearing throughout my pregnancy. And while there has been a lot of Lulu Lemon and leggings in my life, I have really tried to find some real clothes that work for me. After month six though, getting dressed takes forever. Even more so now that I am weeks away. Luckily, I have a few standbys that are comfortable and keep me from schlepping around. Plus, I have been able to wear things that I can get some use of after the babe is here. Here are a few of the casual looks that I have been wearing a lot. Please excuse my amateur photo skills. Note that many of these pieces are no longer available, so some of the links take you to similar options. 2. This Joie sweater was a favorite before I was pregnant. These leggings are Pea in a Pod, over the bump. Super soft and comfortable. The boots I got knowing that I would have trouble zipping up or getting off knee high boots. I love the buckles and the shearling inside. When I have to dress up, I always wear tights and am still sporting heels. I usually just bring a pair of flats in my purse in case I need to switch. 2. I love this dress, not maternity, just got it in a larger size. It is from FROCK in Studio City, my friend's new amazing store. 5. Sometimes going tighter is fun, especially when going to a party where you want to make it known that you are pregnant. Nothing worse than people looking at you and playing the guessing game. This Rebecca Taylor that I have had forever barely zipped, but had some good stretch. 6. This Style Stalker blouse is also from FROCK in LA. I love the print and it was super comfortable for a cocktail party. Mix in here plenty of over sized sweaters, lots of leggings, and lounging wear, and you pretty much know what I have been wearing for the past few months. I have yet to sacrifice comfort for style and I think that is what has kept me happy and out of sweat pants.